The metamorphosis of Rigoberto Gonzalez. The specter of González’s grandfather haunts Autobiography of My Hungers, a slim volume of candid vignettes that illuminate an artist’s blossoming against a backdrop of brutal poverty and emotional tumult. There are other ghosts, too, including González’s alcoholic father and his harassed mother, whose death at 31 from an aneurism was the catalyst for the shattered family’s return to his hated grandfather’s home (at one point, González lived there with 18 members of his extended family -- with three bedrooms between them). It was there that González, the only one who could read and write, found refuge in books. He recalls reading Philip Roth’s Portnoy’s Complaint by the light of the kitchen and being made aware of other avenues in life, alternate realities to the dismal prospect his grandfather represented. 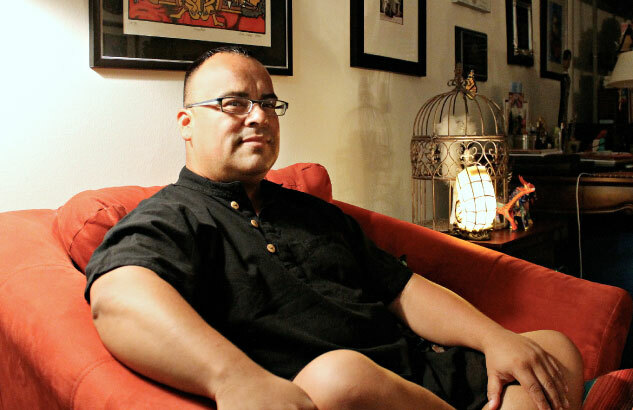 “The English language was my power and my doorway to a lot of opportunities: into individuality, into uniqueness, into intelligence,” says González, whose 2006 memoir, Butterfly Boy: Memories of a Chicano Mariposa, received an American Book Award. Literature was also the key to unlocking the mysteries of his sexuality, in particular an encounter with Truman Capote on a late-night TV screening of the comedy–thriller Murder by Death, starring the author as the effete host of a dinner party at which the world’s greatest detectives gather to resolve a murder. Such tensions animate the pieces in Autobiography of My Hungers, snapshots of his long coming of age, from the mundane to the profound: Here is a young boy bracing himself for his first ride in an elevator; here, the same boy, bracing for his mother’s death. We watch him growing up, establishing his adult identity, navigating a series of lovers, confronting unexpected frailty.